WELCOME APRIL 2016 | A.B.E. Remodeling, INC.
We just wanted to slip in a welcome to the month and hope that you all will blessed with good times, good friends and good health. 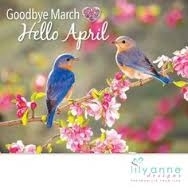 So here's to say...> hello April. By the way, now is the time to think about "sprucing" up your home's exterior area. You might want to add a deck or update a wooden deck with a limited maintenance deck. Maybe enclose or add a porch. Maybe a sunroom addition. Maybe a gazebo or pergola would be an exciting update to your yard. We've been getting calls about patios and decks….so please if you want to -give us a call to discuss your "dreams". That's our plug. And to you-our customers, thank you for entrusting your projects to us. We appreciate your support. HAPPY APRIL TO YOU ALL!. Be healthy. Enjoy life.